How old is human warfare? In a paper published this week in the journal Nature, archaeologists report the discovery of the oldest evidence of mass violence to date—the remains of a massacre that occurred 10,000 years ago on the shores of Lake Turkana, in present-day Kenya. Ronika Power, an archaeologist who analyzed the fossilized skeletons found at the site, describes what the find might tell us about early human civilizations. Ronika Power is a Research Fellow at the McDonald Institute for Archaeological Research and the Department of Archaeology and Anthropology, at the University of Cambridge in Cambridge, UK. IRA FLATOW: This is Science Friday. I’m Ira Flatow. The question of the origin of violence in humans is really a thorny question. Have we always been warlike? Did we inherit our violent natures from our primate ancestors, or is it something that we’ve developed later in our history? 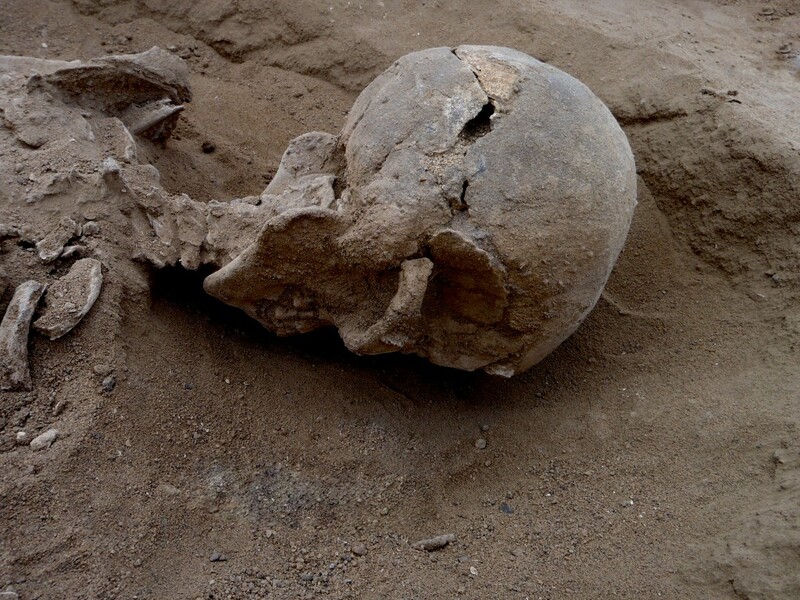 Well, in findings published in the journal Nature, archaeologists report the discovery of the oldest evidence of mass violence to-date, the skeletal remains of a massacre that occurred 10,000 years ago on the shores of Lake Turkana in present day Kenya. Ronika Power is a research fellow at the McDonald Institute for Archaeological Research and Department of Archaeology and Anthropology at the University of Cambridge. She helped analyze the fossilized skeletons found at the site. Welcome to Science Friday, Dr. Power. RONIKA POWER: Thank you so much, Ira. It’s a great pleasure. IRA FLATOW: Oh, you’re welcome. Tell us about the sit. What was found there? RONIKA POWER: So at this site, the site is called Nataruk, and it’s in West Turkana in Kenya. And at the site we found at least 28 individuals in total, and there’s a demographic range of people that were found there. And amongst them there were five young children, one teenager, 21 adults, and one fetus. And of those 28 individuals, we found 12 skeletons that were found as they died unburied and with their bodies articulated in anatomical position, but in very unusual positions. And of these 12 articulated skeletons, 10 of these show skeletal evidence of the most violent trauma. IRA FLATOW: So they all show signs of being killed, some clubbed. What kind of ways did they die? RONIKA POWER: So the skeletal evidence, the kinds of lesions, the kinds of wounds and injuries that we’re seeing on the skeletons, suggests that there were at least three different types of weapons that may have been used in this attack, Ira. And the different kinds of weapons include things that may have been stone-tipped and sharpened, like arrows. And we call them projectiles. And we also think that there may have been clubs that were used in this attack, and also potentially another what we’re calling a close proximity weapon– so something else that would have been held in the hand. But to make it even more terrifying, more frightful, it’s possible that this close proximity weapon had sharp stones and blades that were embedded in it to give it that extra force, that extra trauma, when the victims were hit. IRA FLATOW: Does this have the earmark of a war or a raid on a tribe that caught them unaware? RONIKA POWER: Well, it does seem as though they were caught unaware. I mean, very interestingly, what we extrapolate from the different kinds of skeletal trauma is that it appears that they were at first taken unawares by things such as arrows. It appears that the perforation lesions and some of the sharp force trauma lesions were caused by arrows, which as you know are more of a medium-range kind of weapon. And so it seems as though they may have been ambushed as they were there on the shores of Ancient Lake Turkana, and then once they were stopped and were obviously and stopped in their tracks by this arrows attack, as the attacking other group came closer to them is when they would have used these more close-proximity weapons. So it appears that there were different ranges and different kinds of attacks that were happening within this whole kind of war or raiding incident, as you say. IRA FLATOW: Can you tell us about these people? When did they live there? What was their community like? Why were they encamped there? RONIKA POWER: Yeah, of course. So these people were what we call hunter-gatherer fishers. They were nomadic people. They moved around. And they were living 10,000 years ago on the shores of Ancient Lake Turkana. And at that time it was very lush and fertile. It’s almost hard to imagine it being that way now when you go. It’s sand and dust and rocks as far as the eye can see. But 10,000 years ago it was lush and fertile, and the In Africa project that discovered these skeletons have also discovered thousands of animal fossils from all different types of creatures, things like elephants and giraffes and hippopotamus and rhinocerae, zebra, and warthog. The list goes on. And we know from the fossil evidence of these animals that the humans were around, and they were hunting them. We can see evidence for them butchering the animals and processing them, and so we suspect that at Nataruk, these people were probably camped there, these hunter-gatherer fishers, to spend some time there and to gather resources, and even to live their lives. IRA FLATOW: Our number is 844-724-8255, if you’d like to join the conversation. Also, you can tweet us @SciFri. We’re talking with Dr. Ronika Power from the University of Cambridge in the UK. So the way you describe it, it seems like a very coveted place to be. I mean, all those resources there, and the place that maybe other people would like to have raided. RONIKA POWER: Yeah, absolutely. I think you’re 100% right. I think what we’re talking about here comes down to competition for resources. I think you’re absolutely right, Ira. IRA FLATOW: And is this really be the oldest remains of a big battle like that? RONIKA POWER: Yes. This is the earliest scientifically dated case of conflict between two groups of hunter-gatherers. It’s an extraordinary find, and it’s exceptional in a number of ways. Not only is it the earliest scientifically dated case, but it’s exceptional also in the fact that the number of preserved remains, of human skeletal remains, for this time period is also exceptional. And also, the fact that they’re in such close proximity to each other– usually this kind of preservation and that kind of closeness of skeletons being together is only observed in cemeteries. And we don’t have that for these nomadic people, and that’s also why this evidence is so exceptional, because to find evidence of warfare amongst nomadic people in the archaeological record is extremely rare. IRA FLATOW: Why do you think that they weren’t buried? They were just left where they were. I’m thinking that maybe their comrades would bury them? RONIKA POWER: Yeah, but that’s assuming that there people left alive. IRA FLATOW: Oh. Oh, that’s crazy. RONIKA POWER: Yeah. It’s a haunting image. I would encourage your readers to access the article through the Nature website and to have a look at some of these diagrams. It’s very evocative to see these people in such unusual positions, and we can tell that they fell and that the sediments of the paleolagoon have covered them as they lay. And they stayed there for 10,000 years until our team from the In Africa project happened upon them in 2012. IRA FLATOW: So sort of like a Pompeii sort of burial? RONIKA POWER: Yeah, exactly, in times of a frozen moment in time. And the nature and the position of the bodies and the nature of the lesions– as scientists, we are certainly trained to be objective and to carry out our work with a certain amount of distance. But as a human, you can’t help but look at all of this evidence and be really moved by it and really feel for these people. IRA FLATOW: Yeah. There’s a skeleton of one woman that was particularly striking. She was pregnant. RONIKA POWER: Isn’t she incredible? IRA FLATOW: Six- to nine-month-old fetus still inside? RONIKA POWER: Yeah, that’s exactly right. IRA FLATOW: And you could see that? RONIKA POWER: Yeah, absolutely. So she really is an incredible case, Ira. And the fact that she’s in that almost seated upright position, and we see that her arms are placed between her legs. And the very unique position of both her hands and feet indicate that she could have been bound. Her hands and feet could’ve been tied together at the time that she died, and you reconstruct that image in your mind and you see a lady with a large pregnant belly. And we discovered the remains, the bones of six- to nine-month-old fetus within her abdominal cavity. And what this shows you is that no one was spared. The kind of vulnerability that we see about this particular site is that every one of every age group was vulnerable at Nataruk– men, women, even pregnant women– young, old. Unfortunately, it does seem as though no one survived. IRA FLATOW: A ferocious attack. This was done on purpose, is what you’re saying? RONIKA POWER: Absolutely. Absolutely. And I think that what this shows you is that under certain conditions, fighting for what others have may be the only ways that humans in certain conditions can survive. IRA FLATOW: Let me go to the phones, if I can. 844-724-8255. We have a call from Augusta, Georgia. Heather, hi. Welcome to Science Friday. HEATHER: Hi there. What a fascinating conversation. I had a quick question. In the description about the brutality and the weapon used, it made me actually think about Mezoamerica and pre-Columbian warfare, particularly with the Aztec empire. And I’m wondering if the description of the club makes me think of embedded obsidian glass into clubs that were used in that area. Is there any similarity to what you’re finding? I know across space and time, it made me think of that same type of weaponry and that same type of violence. RONIKA POWER: What an astute question, Heather. Thank you so much. And we do know from the evidence that we have that obsidian blades were also used in this attack. We have one of the individuals that was found with an obsidian point embedded into their cranium, embedded into the top side of the head of the skull. And it’s incredible to find something like that. But to actually find it in situ is incredible. But we also have another obsidian blade that was found amongst what we call a lithic, called a stone tools assemblage. And yes, definitely, we have lithics made of obsidian amongst this. And what’s very interesting is that obsidian actually is quite a rare stone in this area, Heather. And that suggests that the attackers came from or had contact with a different and potentially very distant place. IRA FLATOW: Thank you, Heather. Great question. I guess she’s gone. You seem surprised by all of this, if I would go out on a limb from your reaction. RONIKA POWER: I would say I am almost overwhelmed. I mean, I have dealt with thousands and thousands of skeletons in my career so far, and hopefully will deal with many more. But to see this kind of violence, this kind of brutality, in such a concise and closed community is really quite striking. And I think that I would speak for all of my colleagues on the In Africa project that this has touched us. This has left a really strong imprint on us as scientists and as archaeologists that will stay with us for a long time. IRA FLATOW: I’m Ira Flatow. This is Science Friday from PRI, Public Radio International. We’re talking with Dr. Ronika Power of the University of Cambridge in the UK. Does this make you think differently about how violence erupted among humans? 10,000 years ago is a long time so to speak, but not such a long time. RONIKA POWER: Yeah, you’re right. You’re right. In terms of geological time it’s almost the blink of an eye. But I think that one of the reasons why this particular assemblage, this particular case, is so interesting and so insignificant is because it does add to that understanding of the history and violence of warfare. Now, many scholars have argued that hunter-gatherers, as these people from Nataruk were 10,000 years ago, didn’t engage in warfare. This is why this case is so special. People didn’t think that hunter-gatherers did this sort of thing, because they were not sedentary– they moved around– because they did not own land or have significant positions. And therefore, scholars have thought that they didn’t have anything worth stealing or worth defending. And so therefore, the line of thinking, the logical line of thinking from that position, is that warfare only emerged after sedentism– so after people stopped and were stationary and lived in the same place. So the introduction of agriculture, for example, of farming, and more complex political systems are generally when we see these kinds of interpersonal, intergroup violence, come to the fore. But what Nataruk does is Nataruk shows us that conflict and violence has a much longer history. What Nataruk does is it redefines the conditions under which humans will fight each other, and really makes understanding of these kinds of human engagements much more broad and much more diverse than previously thought. IRA FLATOW: Does it change the way you look at archaeological sites now, in terms of looking for more possibly weapons than you would have in the past? RONIKA POWER: Well, absolutely. I mean, every single case of archaeological engagement always adds to our understanding and always informs the way that you’ll work in the future. And I think one of the really important points about Nataruk in particular, but the In Africa project in general, is that it really endorses the engagement with the local community. And the fascinating thing about these discovery is that the team and our director, Dr. Marta Mirazon Lahr, was actually led to the site by a local person. His name, Pedro Abaya. And he reported to Dr. Mirazon Lahr that he had reported seeing some bones on the surface in a distant place than the team was already working. And so if it wasn’t for the In Africa project’s engagement with the local community, they actually may never have seen this site. And these individuals that we have now come to know and have studied so closely may actually still be lying there on the shores of the ancient lake. IRA FLATOW: Does this lead you to look for more places on the old shoreline? And is this site finished, or is there more to be dug up from this site? RONIKA POWER: That’s an excellent question, Ira. So in the first case, the recovery strategy of the In Africa project was to excavate the skeletons that were exposed. And these are seen as being at the greatest risk of further deterioration. But that’s certainly not to say that there may be more individuals that are there underneath the sands, underneath the desert surface. And part of the In Africa project going forward, and indeed some of its members, the activities going forward will be to continue to work in this area. IRA FLATOW: And you yourself, are you going to be doing some more digging? RONIKA POWER: Wherever the In Africa project works, I can tell you I am very, very keen to follow. It is an incredible place, and the Turkana Basin Institute has been an incredible source of support. I went there in 2013 to study all of these amazing, extraordinary skeletons, and it is an incredible place to work out there in the middle of remote, remote Kenya. And it’s an extraordinary experience, and one that I absolutely hope that I’ll have again. IRA FLATOW: Well, we have a link to the research paper on our website at ScienceFriday.com. IRA FLATOW: It is really interesting, and even 10,000 years later, gruesome looking. I want to thank you, Dr. Power, for taking time to be with us today. RONIKA POWER: It’s a great pleasure, and all the best to you and your listeners. IRA FLATOW: Thank you, Ronika Power, research fellow at the McDonald Institute for Archaeological Research and the Department of Archaeology and Anthropology at the University of Cambridge.